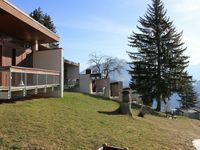 Properties in Leysin average 4.6 out of 5 stars. Whilst small, this perfectly placed apartment was a lovely home from home. 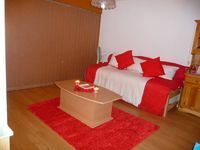 I had the pleasure of spending a week in this apartment and whilst it is small, it is very homely and would be perfect for a couple. The kitchen is small, but had all the amenities I required, and of note was the convenience of a dishwasher. The bed in the lounge area was very comfortable and the view out of the window across the valley in the morning was stunning. Its proximity to the blue run back into Leysin made this a ski-in apartment as there was plenty of snow in the meadow, I was even fortunate enough to ski down to the lifts along the main road after some heavy snow! I look forward to returning to this apartment in future years. Audrey and Brock where great hosts . I would recommend staying at Leysin Lodges Brock father even gave us a lift to the station . I would highly recommend staying there Leysin is a lovely place great views .